Review: Barber Shop Chronicles. (touring) Curve Leicester studio. – East Midlands Theatre. As American editor and writer Thomas Dreier once famously said “The world is a great mirror. It reflects back to you what you are. 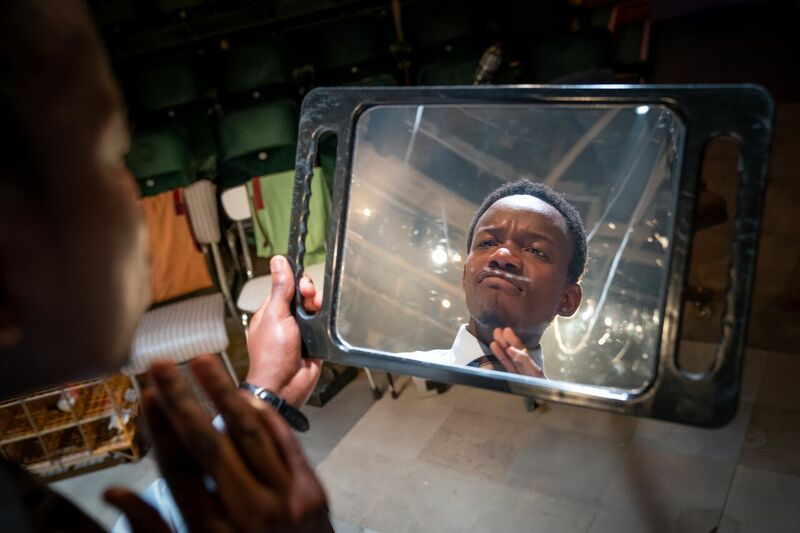 If you are loving, if you are friendly, if you are helpful, the world will prove loving and friendly and helpful to you.” Inua Ellams’ accessible, brave and startling play, Barber Shop Chronicles frequently uses barber shop mirrors to judge the response of the black male haircut sitter. How cool do they look with their sharp new styling? Very. The unanimous result from virtually all the male barber shop customers is a sharp intake of breath and an expulsion of joyous noise. And maybe a short, full of life, dance. As audience members, our own hearts and souls dance and become joyfully affected by this extra-ordinary play that leaps from a barber shop in Peckham and onward across the world to Johannesburg, Harare, Kampala, Lagos and Accra all in the course of a theatrical single day. Two clocks on the back wall keep time throughout. Even coming into the studio space at Curve Leicester our expectations are greatly expanded and surpassed by designer Rae Smith’s stunning set of a giant barber’s shop floor surrounded up above by telegraph poles strung about with looping entangled wires. The space is dressed up with barber shop business adverts from across the globe and up high and slightly off centre is a giant wire globe which lights up for each destination. Moreover, the pre-start period becomes slowly peopled by the cast and audience members are warmly welcomed vocally and with handshakes and even get an opportunity to have one’s photo taken in a barber shop chair complete with cape. One little girl gets to impromptu dance with the guys in the cast and this is an unpredictable moment of pure human magic just for tonight. Collectively, this is an exciting and vibrant preamble to Barber Shop Chronicles! Actors, Michael Balogan, Emmanuel Ighodaro, Elander Moore, Toni Bamtefa, Demmy Ladipo, Anthony Ofoegbu, Manyard Eziashi, Mohammed Mansaray, Jo Servi, Adé Dee Haastrup, Rudolphe Mdlongwa and David Webber co-create an exceptionally good stage performance through director Bijan Sheibani’s clever input. As a whole, this poetic theatre piece is a coherent mish mash of brilliantly choreographed drama through diversely actualised story-telling. In its multiple virtuosities it shines out as a worthy success. No wonder it sold out at the National Theatre. The result is a truly spirited exposition brought thrillingly to life by Inua Ellams’ adroit and often poetic writing. Ellams is a poet after all. Being cocooned in the barber’s chair and protective cape acts almost like a confessional for the men of colour. Their male pride and insecurities are brought out through soul stirring group singing and active arguments and discussion on the nature of manhood. Many of the topics prove very funny, including a running gag about three men who go into a bar buzzing with flies. Many interactions amuse but we are also drawn into more intimate topics including that of alcoholism. These topics reflect African men’s culture and interests. We hear contradictory and discursive interpretations of racism and racist language, wealth, class, financial poverty and poverty of spirit. Most prominent are discussions about fathers and the relationships that grow or stagnate from a father-son kinship. The barbers become like counsellors and occasionally healers of family warring. Sometimes the action and talk appears and attempts to re-define black masculinity and there is plenty in the play that considers forgiveness even during the wildly emotional heights of an unseen televised football match between Chelsea and Barcelona. There are political topics aired out loud concerning the contemporary world of African and European politics and the amplified sound of an electric shaver creates a frisson of background aural excitement that makes the drama truly electric. As far this reviewer can tell the guys’ accents from across the globe are super authentic and very impressive, but sometimes the ear strains to hear precisely what is being said. But then, the overriding emotions and body language convey the intimacies and more aggressive sentiments relating to identity and notions of displacement perfectly. We can almost feel the heat and dust of these African exchanges and the environments conveyed are very believable. 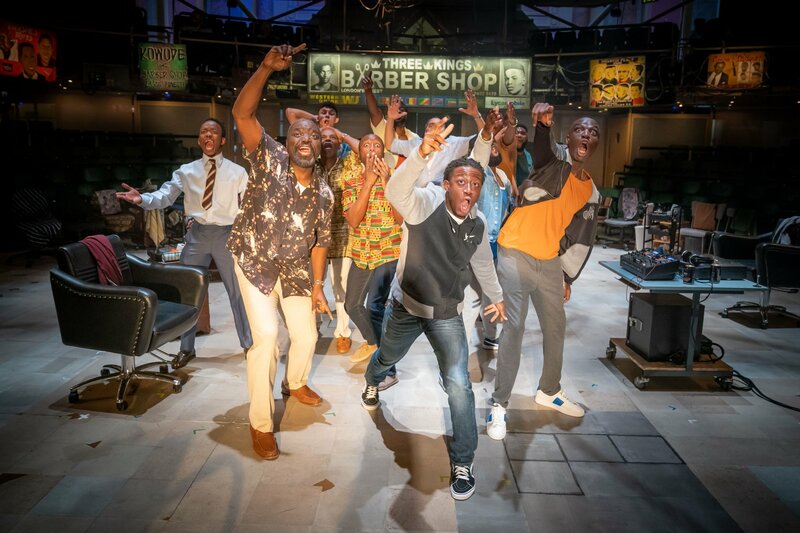 The electrifying ensemble work and individual interpretations of the barber shop world and its very human characters offers up plenty of heft and sway on stage but most importantly the play gives us a feeling of unity with the men and their lives. Unified we leave the theatre with the very strong impression that we have met a great selection of new friends from unfamiliar parts of society. In our hearts now sit compassion and joy brought about by laugh out moments, relatable family dramas and a cathartic, irony filled, wryly poetic end piece. Time to reflect and check out how sharp we appear ourselves, actually, metaphorically and physically. Maybe it is time for a haircut. Hopefully the barber is still open. 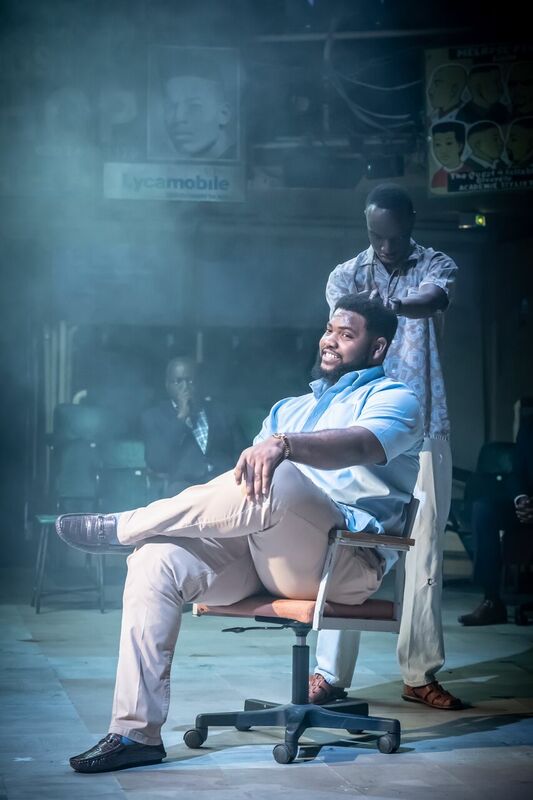 Barber Shop Chronicles runs at Curve Leicester until Saturday 6th April. 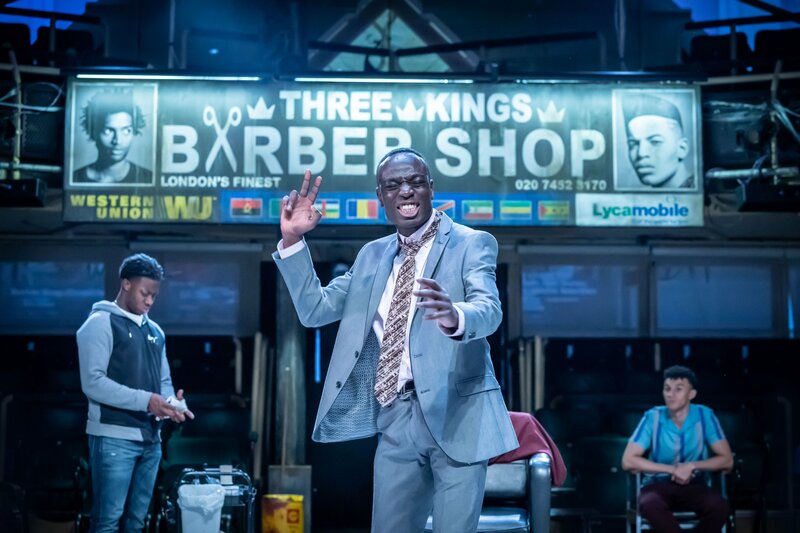 Barber Shop Chronicles is a Fuel, National Theatre and Leeds Playhouse production.